Paris, for example, does everything London does in half the space, with the same number of people (to quote Ken Livingstone). Which is a good thing in terms of urban viability and countryside protection. Problem's always been, us Brits just love to stretch out. We love our suburbs, our low-rise and our open skies. We're going to need some tough love from our politicians, quangos and planners if we're going to get in line. The kind of people that politicise, quang and plan our public transport, for example. They ought to know that one of the unique marvels of an underground rail station is that it needn't occupy any surface space at all. All you need is a hole in the ground with a wrought iron awning (a la Hector Guimard), or perhaps an elegant little building, tucked neatly under a bigger one, a la Leslie Green or Harry Bell Measures. They knew all about "air-rights" 100 years ago! The station buildings were constructed with flat roofs and reinforced steel frames with the deliberate aim of selling off that valuable skyward square footage. 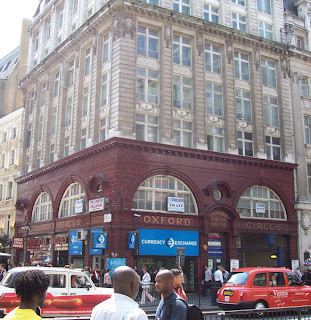 Leslie Green's classic Oxford Circus station: classy burnt russett tiles - check! ; reinforced steel structure - check! ; sufficient contextuality affording a neat contribution to the density of the metropolis and urban viability - check!!! It gets worse though. Out west and as I write this, Harry Bell Measures' dear old Shepherd's Bush station is being replaced with an even bigger monster. The new Central Line station sits like some genetically-modified conservatory that couldn't make it round Holland Park Roundabout on its way to the Chelsea Flower Show. Gone is the human scale of the hole in the pavement as is the pragmatic capitalisation of what is prime central London real estate. It has what planners call a large "footprint". You can't miss it and it ain't gonna get out of your way. Its' a huge glass atrium, has no internal access to the new Overground station next door, is costing around £65m and is totally...empty! "Nul points" Shepherd's Bush. 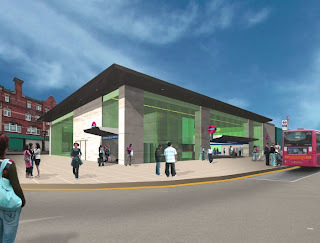 Artist's impression of the new Shepherd's Bush Central Line station. As you can see, it's space well-used. It contains, erm... nothing. 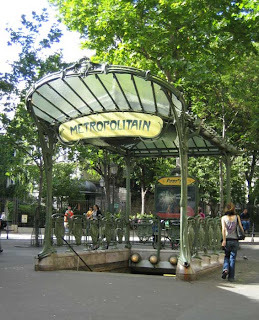 It looks unlikely that London will ever discover the charms of Hector Guimard's discreet human-scale chic but the contextual pragmatism of the Central and Northern line pioneers may have a future. 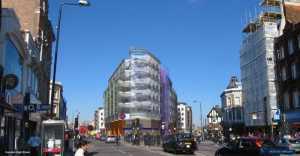 The proposed Camden Town redevelopment features a steel and glass office building incorporated into the original design. But at a price. So far more than 16 plans have been rejected for the £135m (! ), seven year project, mainly on the grounds of conservation as several Camden landmarks would be demolished. Camden Town's latest proposal (rejected): points for using the space, shame about the landmarks (and the price!). You can't have it all. What seems clear is that if we are serious about combating the problem of suburban sprawl and "densifying" our inner cities our planners need to reconsider their priorities. Whilst schemes like Crossrail are beneficial in some ways (although vastly expensive), who will want to stay in inner London if it's quicker to commute from the home counties? This is going to require some hefty transport improvements for inner (and especially south) London. Whilst perhaps insignificant in the larger scheme of things, wasted space above underground stations demonstrates how seriously the issue is being taken. Assuming it can't keep the Electric Ballroom et al intact, the Camden scheme is right about one thing - incorporating its new tenants from the start. That way the space does get used, and presumably London Underground will make a buck or two as the landlords. That's the lesson from Southwark and others. In 108 years no-one ever did build on top of Harry Bell Measures' dear old Shepherd's Bush.